Stealing the Sun begins in a traditional way, but then takes a turn that defies traditional fantasy story telling. What was your approach to writing this story? The story developed organically. I started with reflections of traditional fantasy tropes (the elven maid falls in love with the mortal hero; the evil dark lord) and went from there. In some cases I deliberately twisted things (the ‘evil dark lord’ character is female and primarily interested, not in dominating the world, but in escaping from it), but in other cases my feelings about the story, my sense that there was another side to be shown, took over. Once the scene was set and a given character did something, others would react, often unwisely, and in that way they all managed to get themselves in a lot of trouble by the end of the book. I felt that Stealing the Sun delivers the drama so well that it flirts with the grimdark genre. Was it your intention to give the story a darker tone? In your other book, Tribulation’s War, the magic in that story was minimal and delivered believably (if magic can ever be believable) as it was in this story as well. How did you handle the magic in this story and how did it evolve as you were writing? Most of the magic in the world of Stealing the Sun isn’t really magic but science (sort of). I wanted to look at elves, at the way that elves are traditionally portrayed (immortal, unsleeping, able to see in the dark and take sustenance from the sun, able to shapechange) and make those qualities make at least quasi-scientific sense. To be ever-young, it seems to me that a creature would need to be able to shapechange, to get rid of old, damaged cells and regenerate them. When Altir visualizes the “moving spirals and the beads of light” before he shape changes, he’s actually consciously manipulating his own DNA, although he doesn’t know that’s what he’s doing. There will be much more on shapestrength in the later books. The rune-magic of the greycloaks, on the other hand, is something I have never figured out scientifically. Basically it’s just magic, or at least psychic ability, with a good dose of nasty herb-lore mixed in. Stealing the Sun has some interesting people that have their character flaws, but they’re still likable. 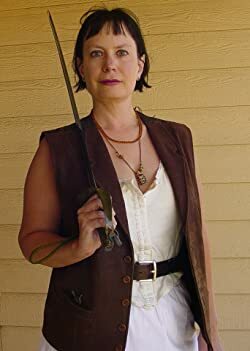 How do you go about creating characters for your stories? Characters come to me organically, without much planning involved. They seem to already exist by the time I get to them. I create a world and situations that contain conflict, and out of the conflict comes the sort of characters who fit with that world. Sometimes the characters who seemed like supporting cast end up having the strongest voice – Altir originated as a secondary character in a short story. In the next book, The Dark of the Sun, someone who didn’t get his own point of view in the first book insisted on telling his side of the story. I like characters who have different facets, who have flaws and strengths, who have a past – I’m not particularly interested in innocent coming of age characters, or one-dimensional villains, either to read about or to write. When is the next book in the Sun Saga series due out? The Dark of the Sun and A Red Morn Rises, the second and third books, are available now. There may be a fourth book to come. Disinherited from the throne he believes should belong to his clan, rejected by the woman he loves, estranged from his father and uncertain of his place in a war-torn world, Altir Ilanarion searches for his path. Meanwhile, his kinsmen scheme and plot to overthrow their rival and regain the throne — but all the while, the Liar’s servants lie in wait. 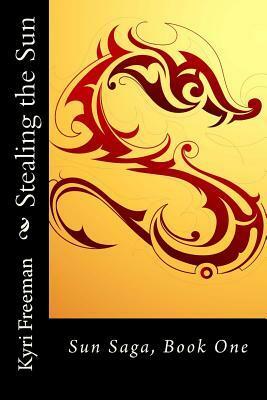 Stealing the Sun by Kyri Freeman is the first book in the Sun Saga. Altir Ilanarion is a young man from a proud family. Once, his grandsire was High King, but his eldest uncle ceded the throne to another and disinherited his heirs. Invaders now scourge their lands, killing everything in their wake, tearing down forests and laying waste to their holdings. Altir ventures into to the neighboring land of the Greycloaks, hoping to make allies against the invaders, and in the process, falls in love with the Greycloak King’s daughter. Kovannin Ilanarion, beloved of Altir’s uncle Tiano, is the most talented craftsman and diplomat of the Western people. His greatest wish is to see his lover retake the throne of the High King for his clan. He plans to forge alliances against the High King, using both his silver tongue and his skill in crafting weapons of war. Stealing the Sun began in a familiar way. At first, it seemed to be the story of a young man defying his father in order to save the lives of his people and win the woman he loves. But the author, Kyri Freeman, took unexpected turns with the story that defy the traditional sagas of high fantasy. The book flirts with the grimdark genre without being utterly dark and devoid of hope. The author doesn’t shy away from portraying the characters honestly. Altir and Kovannin are sympathetic protagonists, but their ingrained prejudices and ambitions often blind them to folly. That tension, along with thrilling battles and action, kept me flipping pages. The world building here is very clever. The author does a masterful job of describing both the physical and political landscape through the characters’ eyes. It’s also obvious that the People are not human. Though their physical description is human-like, there’s an almost too-subtle clue that they are quite different. There are other beings in this world as well; the Woodfolk, and Wighten, who could be either allies or enemies, and the Blankfaces and Draugar who are bent on crushing everything in their path. One thing I liked about the book is that magic is known, but it is mysterious and rare. The People use weapons to fight; there are no mages flinging spells into battle. The Greycloaks use runes, but they are incomprehensible to the Western people, who have no inkling of their use or meaning. The magic in this book is subtle, appearing in dreams, or manifesting during times of great need. In short, the magic is magic, and it’s handled in a way that makes it special. There were a few things that didn’t quite work. One concept that wasn’t fully developed was the significance of “the Nine.” This is an important plot point, with both nine gods and nine worlds mentioned without any explanation. Though the People mention cruel gods, rebirth and death, that particular bit of world building is a mystery. There’s also a particular feature of the Greycloak’s keep that seems ominous and important, but wasn’t elaborated on at all. I am hoping that it’s touched on in the rest of the trilogy. Overall, Stealing the Sun is an action-packed story, with flawed and interesting characters. It has all the intrigue, politics, romance and betrayal that fantasy readers expect, along with twists in the narrative that are entirely unexpected. I look forward to the rest of the series.